Birmingham’s School of Jewellery has been located in the heart of the city’s famous Jewellery Quarter since 1890. Staff at the school are recognised as experts in their field and support award-winning students through their chosen course and into professional life. Whilst today’s students must still practice and acquire the intricate skills which we traditionally associate with the jewellery industry, the enthusiasm for supplementing this knowledge with experience of using the latest technology has led the school to invest in another Laser Welding system from Rofin-Baasel. The jewellery industry is often perceived as being built solely upon a detailed knowledge of precious metals and gems coupled with intricate manual skills and techniques, which have been used for generations. In reality however things are quite different within many jewellery workshops, where laser technology rubs shoulders with traditional skills and craftsmanship. The latest laser is a Rofin Desktop model, a compact table top laser system for manual welding. The Desktop has been designed specifically for use within teaching environments, laboratories, and workshops and is an ideal entry level into laser technology. The system is also ergonomically designed and can be sited on any desk or worktop. This air-cooled system requires only a single-phase power supply, so can be used almost anywhere. This latest and significant investment further consolidates the reputation of the School of Jewellery as the largest institution in Europe for the provision of education and training in the fields of jewellery and related subjects. Courses offered by the school cover a wide range of types and levels of experience: from introductory classes for secondary schools through to Ph.D. research degrees. 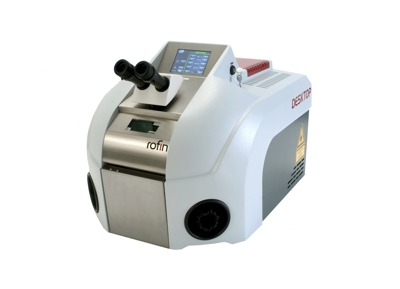 Rofin offers a complete range of lasers including CO2, YAG, vanadate and fibre lasers. Rofin also provides solutions for laser cutting and marking applications.